The introductory pages in Mona Brooke’s book Drawing with Children should be required reading for every parent who hopes to encourage a young artist. These fifty pages are a simple guide to knowing how to offer art projects, give constructive feedback, and present a positive attitude that is so very necessary to encouraging an artist of any age. Reading these pages would save a lot of heartache and frustration. I value the advice so much that I read the introductory pages in this book every year right before school starts.This year it has been especially helpful. Every homeschooler should own a copy of this book. I am currently leading an art class two times a month where the youngest student is eight and the oldest is thirteen. They are all at various stages in their art skills, some having had taken art classes before and some are true beginners who think they can’t draw at all. I approached my art class this week as a fun time where there would be no right and wrong answers. We focused on the process involved by learning to use the brushes right, experimenting with paints on scratch paper, and giving and receiving feedback from each other…including other students. I watched as some of the students wanted to give up after their first tries at the project were not what they anticipated, making a lot of negative comments to themselves. I think that it is terribly insightful to hear how children encourage other students and then turn to their own work and become super critical. I tried to help them see that we are all in different stages of our lives and abilities. I explained that creating art is all about solving problems and we each can learn to solve the problem if we don’t give up. “Help them remember that it is a question of deciding whether or not they choose to change something that they don’t like.” Drawing with Children, page 35. In the end, after some coaching on my part, applying some of the ideas from the Drawing with Children book, everyone ended up with a project they were happy with. It meant starting over for some with fresh supplies and fresh attitudes. It meant looking at more examples and looking at how fellow students were solving the problems differently than they were….using imitation and yes copying from each other. 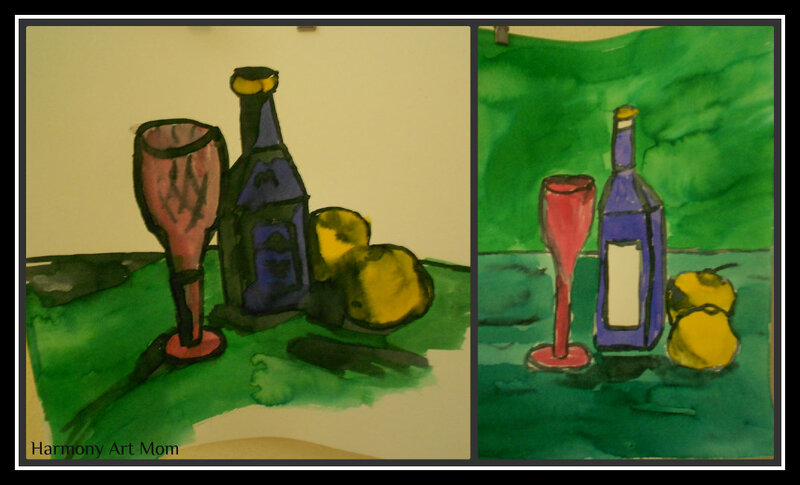 How did you make your wine glass look real? What colors did you mix to make that effect? Going back and filling in the white spaces. Creating a “mood” by picking certain colors. If you don’t have a group of children working together, either siblings or friends, perhaps the parent needs to participate so that the child can learn from you and you can learn from your child. Yes, I totally am serious about learning from you children. They have such an innocent outlook when it comes to projects…their style is freer, their colors are more bold, and they usually are better at looking at shapes then we are as adults. I find that just sitting and working with my children encourages them to be braver with their artwork. If you have this book on your shelf, pull it out and read those pages today. Don’t try to teach another art lesson before you read the encouragement and guidance found in the first fifty pages of Drawing With Children.